Beautifully molded and finished translucent mat-finished acrylic flowers and leaves. Flowers include morning glories, dogwoods, baby's breath, Iris, Calla Lilies, colorful leaves.... Lightweight and saturated with color, these flowers are great for any project that needs them in clusters and colors. A kit that's quick and easy for everyone AND you can wear it as soon as you are finished! We're offering the kit in 3 different "sizes". The Large clip is for adults and will hold an updo. (imagine a cascade of flowers coming from even a simple style... ). We've got the mini clip that works well for children, their small size and equally small flowers are perfect for little girls who want to look "dressy". 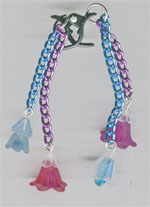 The Clip on the right is the large clip with extra flower beads and embellishments. 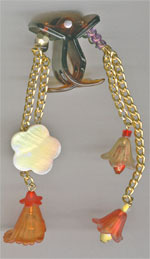 You can order extra "embellihsments" for both the Large Clip and the Mini Clip. You'll get extra chain, flowers, leaves, butterflies and more. This is a sample of the Large Hairclip. (The large flat flower will not be used. instead, we'll use matchng flowers.) This also comes as a workshop project for 10. We do offer an "embellishments bag" so that you can make it more intricate. This is the Mini Hairclip. We do offer it with a small "embellishments bag" so that you can make it more intricate. 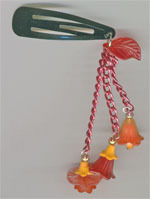 This is the small metal hairclip. 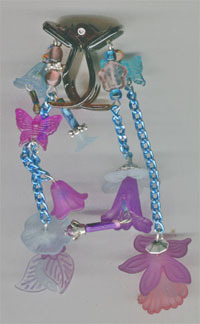 This type of clip is perfect for children, easy to put on and stay. 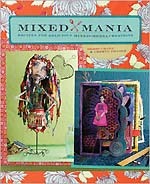 Mixed Mania: Recipes for Delicious Mixed Media Creations. If you are into Mixed Media... How can you resist that title? Mixed Media Explorations: Blending Paper, Fabric and Embellishment to Create Inspired Designs The cover alone looks fabulous!